GPS has been getting more popular over the past year, with many more GPS navigational units coming onto the market, and several have now emerged for the Pocket PC. I've been used to using Microsoft Autoroute on the PC, and transferring exported maps to the Pocket PC to take with me on trips when visiting other towns and cities. Autoroute is quite good on the PC, but the exported Pocket Streets maps are quite weak and do not offer the full detail that the PC version offers. This is where NAVMAN comes in. Ask anyone in the Pocket PC community, which maps are the best on the Pocket PC ? Everyone unanimously chants TomTom (aka Palmtop.nl). When you have a good product, you have to have the best piece of software to match it. So don't be surprised when I say that the NAVMAN offers a re-badged version of the TomTom maps! 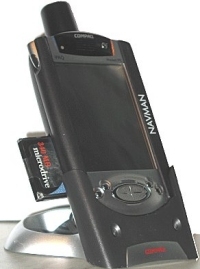 The NAVMAN is currently only available in sleeve format for the iPAQ, and Palm devices. The iPAQ sleeve is slightly thicker than the iPAQ PC card sleeve by a couple of millimeters. It also has a large aerial sticking out the top that reminds you of a large marker pen (see fig 1). Unfortunately due to keeping the sleeve as thin as possible there was only space for either a battery or a CF Type I/II slot. As you will need to install several megabytes of maps, NAVMAN decided to do away with the battery in favour for a storage medium. This therefore means that the NAVMAN runs off the power of the iPAQ battery. Being a Type II slot, IBM MicroDrive users will be pleased to hear that you can use your MicroDrive. However, I should state at this stage that one of the leaflets that comes in the NAVMAN box does stipulate "It is not recommended that Compact Flash Microdrives are used in the NAVMAN GPS i series Compact Flash socket. The power requirements of Microdrives typically exceed the available current supplied by the Compaq iPAQ". Unfortunately this is true if you are running the NAVMAN on battery. Running the NAVMAN with MicroDrive inserted and the GPS turned on with iPAQ on full brightness, the battery power drops to 70% in 15 minutes! Fortunately the NAVMAN comes complete with an in-car charger which is recommended for use. If you have a 3800 series iPAQ then you'll need to use your AC/DC to USB converter plug too. The in-car charger powers both the iPAQ and NAVMAN whilst charging the battery to stop any battery drain. Supplied in the box also is a windscreen/dashboard suction mount. Once the suction clip is pushed down to create the suction through the cup, there's no pulling it away. On the back of the NAVMAN there are two slots which the bracket arm of the suction cup slots into (see below). Why can't mobile phone companies sell a device like this ? Well done NAVMAN! When powering on the GPS Receiver, it has to make a reading off of several satellites before it can triangulate your position. This is called Time to First Fix. When the GPS unit is first powered on out of the box (straight from the factory), it can take up to 20 minutes to get your first TTFF. After this, varying degrees of powering off and on, over several days only took under 1 minute to get the first fix. (Fig 3) shows the GPS in operation. There are two settings that can be used. 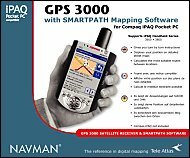 NAVMAN GPS Receiver and SIMULATOR. NAVMAN GPS Receiver should be used when you are out and wish to receive signals from the satellites to triangulate your position. The Simulator option is good for indoors when you want to test that the software is working correctly and simulate a satellite signal. The NAVMAN comes supplied with two CD-Roms. One is the Smartpath Trips CD which includes a general atlas for most of Europe. This will take you down to major A roads in the UK allowing you to plot journeys from A to B (See Fig 4). The second CD is Smartpath City Maps (Fig 5). This includes 600mb worth of city maps covering over 100,000 cities from the UK and Europe. Most of the City maps are around 500K to 1mb in size and do include neighboring towns and small villages so if you do get lost, and move out of the area of the village or town you are in, then you should be fairly well supported. I've tried several city maps in the UK, driving around plotting routes and I have yet to get lost! The one negative point I have about the maps is that only major roads have road names shown. When you get to around 80% zoom, minor roads and side roads start to become labeled. However, the smallest of road names don't appear until you are in 100% zoom mode see Fig 9). With a PocketPC screen, you will not see many roads at 100% zoom (especially if you're traveling around 30mph), so this is a little let down. At any zoom level, you can click on any road with the stylus and it will display the full name of the road (See Fig 6). This can prove rather difficult whilst driving a car and could become quite dangerous and is not advised! Another feature of the Smartpath City is that the map shows one-way roads, making sure you don't drive the wrong way down a one-way street. Most people only believe foreigners do this, although if you're driving and trying to navigate a map at the same time, it is quite easy to fall into this trap. You also have the option of changing the distance from miles to kilometers depending on your preference. Route Planning has never been made this simple. Just tap and hold the stylus on a road on the map and you'll get a pop up menu appear where you can select the departure, destination, or stopover waypoints. If you don't know the area of the map you wish to travel from, but do know the road name or designation, then you can click on the magnifier glass on the toolbar and specify by name. Once you've set the departure and destination, you can then calculate the route. Smartpath City will highlight the route it believes you should take (see fig 7). With Smartpath City, you can also set favourite locations where you can plan routes from one favourite location to another, allowing for quick route planning if you are traveling the same journey on more than one occasion e.g. from home to work, or hotel to course. Once you've planned your route, you can either watch your navigation via various levels of zoom on the map, or you can view your journey from a complete walk through of instructions, or enjoy the best of both worlds and have a screen with both instructions and maps integrated together (see fig 8). The maps supplied are very up to date. I did find one road that had changed from a one way to a two way road in the past 6 months and wasn't shown correctly on Smartpath City. However I wouldn't really expect these to be updated yet as offering completely updated maps more than once a year really isn't necessary in most cases. When GPS is enabled you will see a triangle pointing in the direction you are traveling. One thing that hasn't been included which would make this the ultimate package is voice notification of when you are reaching roads or if you've moved off the planned route. Most people when buying electronic mapping software always ask the same questions. How much detail do the maps produce ? Are the maps as detailed as a paper street map ? Do the maps allow you to zoom in to a road ? I have included a map of Southampton City Centre (England) with varying levels of zoom going from minimum to maximum zoom. The zoom detail can be viewed in (Fig 9). 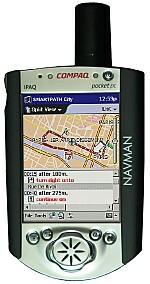 Smartpath Trips seems like a re-badge of the original Route Planner Millennium from Palmtop. This although really isn't good enough for towns and city navigation down to street level, it's certainly good enough to plot long journeys or journeys between towns and cities. Smartpath Trips contains the same program interface as Smartpath City, the only difference is the maps. Smartpath Trips also allows you to select an overlay which will show you places like Railway stations and Airports, but don't expect much more than this. Smartpath Trips and City are lacking in some of the extra features Autoroute users will be used to, like being able to view Petrol Stations, Schools, Bus Stations, and Shopping Centre's. Smartpath Trips and City come with some great features. The vertical zoom slider you can see in (Fig 11) can be changed and placed on the left hand side of the screen for left handed use. You can also toggle ZOOM to planned route which makes life easier when navigating a planned route. An essential feature is Map matching. When enabled this feature matches your GPS navigational pointer to the map. Every 1-2 seconds when the GPS receives updates from the satellites, the map scrolls so your current position is always center of the map. Other minor features include changing the speed on specific roads, to Route highlighting and borders. 32mA average (300ms/1700ms Trickle-power mode with 2 second update rate). Initial acquisition 150mA. "100ms typical, reported at selected update rate." "5.0 meters, typical (95% probable)"
"Initial, every second. Typically every 2 seconds once fix established." "NMEA 0183 Ver: 2.01, GPGGA, GPGSA, GPRMC, and GPGSV." 3.3V DC from the iPAQ�s internal 950 mAh Lithium Polymer rechargeable battery. A major dislike I have is that there are 600mb of city maps supplied on CD, and you have to click on each village and town to install it via ActiveSync. Does anybody know how many towns and cities there are in the UK ? Quite a few! It would have been far more practical if the maps were expanded and provided across several CD's and could be copied to your storage card manually or installed individually via ActiveSync. I used a 1GB MicroDrive with the NAVMAN and it would have been great to kit out the MicroDrive in one copy of all the maps. Instead I spent the best part of several hours trying to include most of the maps I thought I might need (and this in no way covered the whole of the UK!). Currently you would have to download and install the maps you thought you might need via your PC and ActiveSync to the iPAQ before you leave home, otherwise you will have to carry a laptop around with you and a USB sync cable. This isn't a fault of the NAVMAN, but with TomTom maps. Please TomTom, allow this feature in future updates! The second dislike is the CF Type I/II slot is quite tight if you're trying to place a Type II card (IBM MicroDrive) into the CF Card slot. There are no eject buttons, so whichever card you insert you must make sure you have a plastic tab or piece of cellotape attached to the card. Otherwise removing this from the NAVMAN could become troublesome. You can also see the PCB (Printed Circuit Board) in the CF Card slot with holes strategically placed around the PCB, although any of the printed circuit board tracks must be on the underside as there are no tracks visible, this does worry me slightly if some water were to find it's way in there. 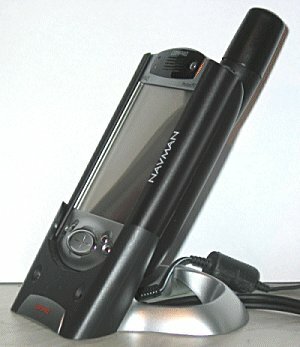 The NAVMAN is a dream to work with on the iPAQ 3850 despite the dislikes. Display on screen in bright harsh midday sunlight is still readable when traveling in the car with the brightness full up. Including a FREE in-car charger is superb! The City Maps are accurate when GPS is used within 5 meters when traveling under 30mph and within 10 meters when traveling under 50mph. The maps are full of detail, and are also up to date. The aerial is quite large, but I would prefer a large chunky aerial if it allows for better receiving strength from satellites. The NAVMAN certainly didn't have a problem receiving signals from any of the 24 satellites orbiting the earth whilst the NAVMAN was mounted on the dashboard in the car. A great gadget if you're looking to add something else to the iPAQ. If you currently do a lot of traveling and you're looking for a GPS or mapping device and you already have an iPAQ, then this really is a must! Install and configuration is so simple! However if you still would like to know where the nearest Petrol Station, Park, Pub or shop is, then you will still want to carry around your Pocket Street maps.